Land Fracture, 1954-55, Oil on upson board, 96 X 77 1/2 in. Collection University of California at Los Angeles. The floral images grew increasingly fragmentary. In reaction I moved on to something more substantial, more tactile: abstractions of land and sea. I wanted something expansive suggesting panorama yet permitting the proximate sensation simultaneously. I found that painting a landscape from a given point of view defeated what I was searching for. I assembled incidents gathered from various sites. I was attracted to Mulholland Ridge. There were no houses up there at that time and I could see that long span of twenty or thirty miles as it had once been beneath the Pacific. It was elemental, primordial. I was intrigued by how a bush rooted itself into the side of the hill, how the land eroded from it: the bush’s tenacity, its insistence on existing. The sheer drop of the cliffs at Big Sur also fascinated me. I found I could alter the axis of my painting as I worked on it. I was painting in an area of abstraction where I could convert a form from rock to cloud. Solid organic things were malleable. JK: It’s a special landscape, this arid desert landscape of Los Angeles, rather harsh. And in fact, though you may move the axes of the paintings around, this very landscape rears itself up suddenly right in the middle of this city everywhere into the hills leading up to Mulholland Ridge. It’s difficult to know what angles and planes one is looking at, especially because we are always driving up and down them everywhere, not walking. JK: So there’s an element of time even in the large landscapes, the land is always in motion here, which continues your flower paintings’ presentation of the life cycle. WB: Well, I have talked as if the rose garden materialized out of thin air. Actually some images of the rose itself drew me the contrast of qualities inherent in the rose: the delicate color, the fragility of the petal, and the sharpness of the thorn. 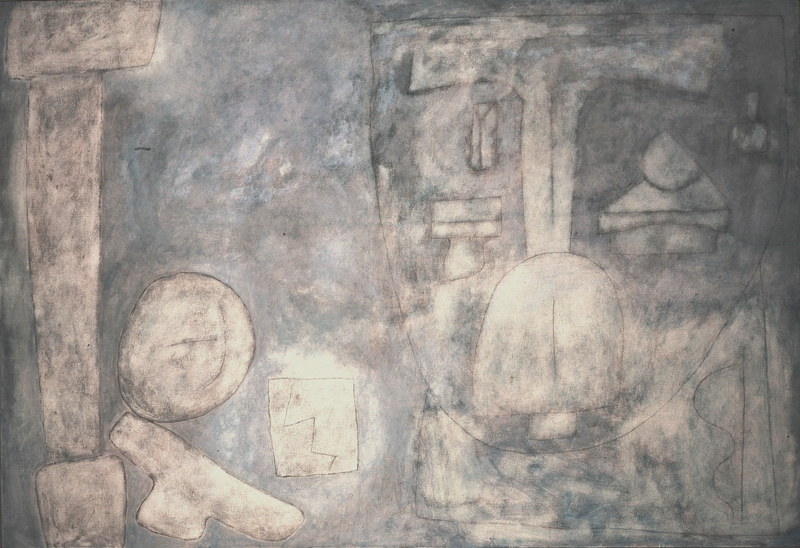 Untitled, 1978, Oil on canvas, 36 X 78 in. JK: The duality in which extremes are commingled? Untitled, 1976, Oil on canvas, 68 X 52 in. WB: Yes. Later in the land-sea paintings, the land is parched, yet the sea’s right there. I wanted those paintings to be walls. I ground the whole surface with desert sand. It wasn’t the idea of varying the surface, using sand as a cubist might, but really to have a surface that would be like a mortared wall. The surfaces of frescoes had always appealed to me. I have never been primarily concerned with transparent application that is, glazing. I tend toward density of pigment, even when it is not heavily applied. JK: What about the figure in your work? WB: During the late Forties, up to about 1956, or from the time I first started, I drew from the figure. But with the exception of one early painting in 1945, one or two, I did not paint the figure. I drew from the model. At that time I did not find a basis for the figure in my painting. Images of rocks, flowers, land, sea, etcetera, occupied me totally. In 1955 I made drawings of people. They were not portraits, not likenesses, but interpretations. 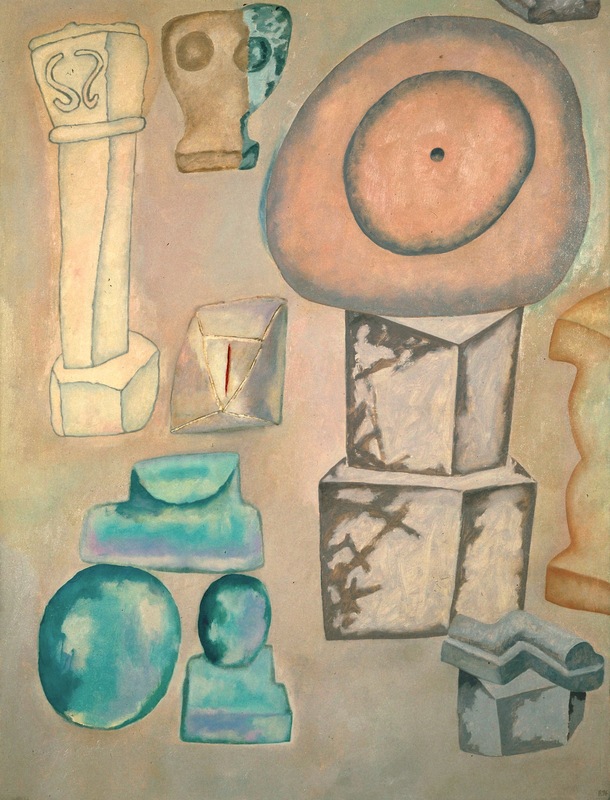 Untitled, 1978, Oil on canvas, 80 X 116 in. The forms become entwined and forever locked together in a symbolic embrace.” That review covered work between 1955 and 1961. WB: What happened is that I began to see figure configurations in those land-sea paintings. I’d made some drawings trying to relate the figure to a landscape. 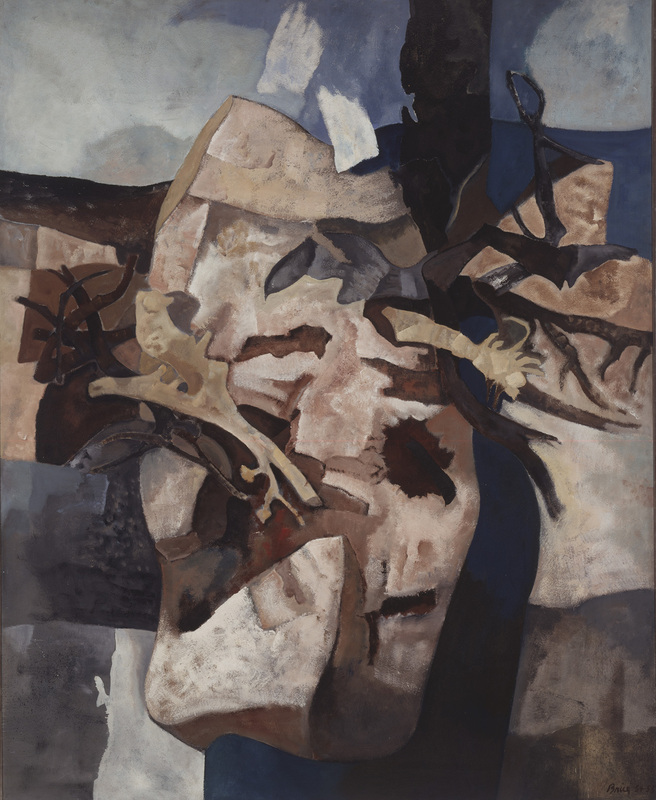 The figures began emerging from the landscape, and perhaps the paintings began to take on the quality of apparition. JK: But not ethereal figures. WB: Hardly. In 1958 I went to Europe, and when I returned I wanted to work towards a more specific, intimate association with the human figure. There followed drawings of female figures in rooms, on beds, of male and female figures, in front of windows.